Make a chocolate boxed cake, according to package instructions. (This generally requires 3 eggs, 1/3 cup vegetable oil and 1 cup of water.) *Add equal parts of red, green and blue food coloring to make it black. Make a white boxed cake, according to package instructions. Divide the batter into two bowls. Add orange coloring to one bowl. Add purple coloring to the second bowl. Assemble: In a well greased Bundt pan, pour in half of the chocolate batter. Add the orange layer. DO NOT STIR. Just pour it on the black cake batter. 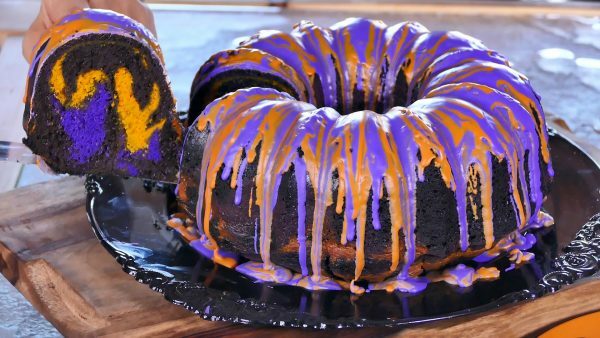 Then pour the purple cake batter onto the orange batter. DO NOT STIR. Finish with the remainder of the black cake. DO NOT STIR. Bake and when cool, turn upside down on platter. Microwave one container of vanilla icing for 30 seconds. Pour into two bowls. Add orange food coloring to one. Add purple food coloring to the second. Drizzle alternately on top of the cake.